Back in 2014, out of Norway arrived a taut, intelligent noir thriller from director Hans Petter Moland entitled IN ORDER OF DISAPPEARANCE so called because the father of the boy killed by a drug lord kills of, in revenge, one dealer after another until reaching him. The film was violent,, absorbing and extremely funny with the father, Nils played by Stellan Skarsgard tossing the bodies one after another wrapped in chicken wire over the waterfalls. 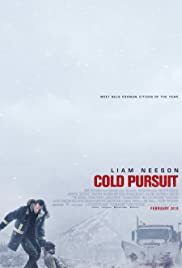 COLD PURSUIT is the Hollywood remake, directed by the same director. Th protagonist is now called Nels (Liam Neeson), short for Nelson. Nels Coxman’s quiet life as a snowplow driver in a glitzy Rocky Mountains resort town where he was just awarded Citizen of the Year is disrupted when his beloved son is murdered under mysterious circumstances. His search for the cause turns into a quest for revenge against a psychotic drug lord named Viking ((British Tom Bateman). Using his hunting skills to transform himself from upstanding citizen to cold-blooded vigilante, Coxman sets out to dismantle the cartel, triggering a chain of events leading to a turf war between Viking and a rival boss. The best segment in IN ORDER OF DISAPPEARANCE, one that I have watched 5 times deserves mention. In it, the drug lord is seated in his design furniture chair with a hole in its back rest peering through the hole to see his ex-wife angrily entering the house demanding to find the son’s gym bag and questioning his parenting skills. He gives her a wad of cash saying that she can use it to find a dozen more gym bags and he has an important and difficult job (drugs) to do. She questions the son’s eating, probably fruit loops to which he screams: “Fruit loops? Fruit loops? I am vegan and I make sure my son eats the proper food.” He keeps screaming at her but she has left the house. The ensuing scene has the boy eating fruit loops in the kitchen with his employees. In the remake, the drug lord, Viking talks about the food that he is feeding the boy. No mention of fruit loops. The furniture with the gaping the back rest is no longer there. The next scene has the boy eating ‘fruit pebbles’. There go the original’s classic scene. In the remake the native Indians replace the Serbs as the rival drug gang. There is more sympathy for the natives than the Serbs, so one up for this change in script by Frank Baldwin. Both COLD PURSUIT and DISAPPEARANCE ends with the credits of all the players listed on the screen, with the names disappearing one by one in order of disappearance from the film. This impressive segment makes no sense in COLD PURSUIT but makes total sense in the original movie. 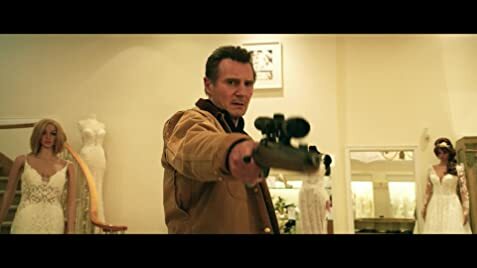 COLD PURSUIT is almost a scene for scene remake.